Hi, I have wacom intuos pro 4. My stylus dont work. Presure and tilt working. Moving dont work. Hi, if your wacom works with Expresii for pressure and tilt, then your wacom should be recognized by Expresii correctly. For panning, you can use Space bar + drag, mouse middle button drag, arrow keys (for fine movement), or touch gesture. Cant seem to make it work in EXPRESII since updating to the latest version. Tablet works fine in Photoshop. Diagnostics dont work either in EXPRESII. 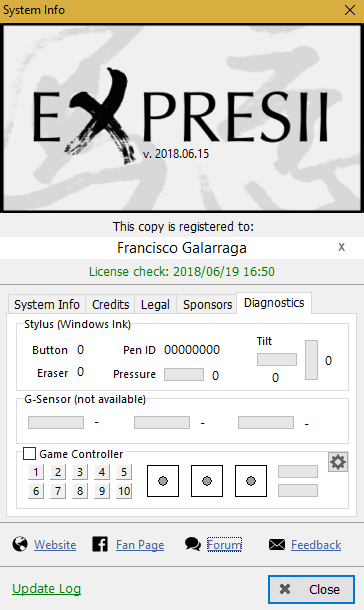 FJGC, I see in your diagnostic page, it says it's using 'Windows Ink'. There's an option in System Settings Dialog>Input>'Windows Ink' checkbox. I apologize if it just switched to 'Windows Ink' checked by itself without your knowledge. Since you're using Wacom pen, please uncheck that 'Windows Ink' checkbox and the pen should work again. Ok so checking that off didn´t work, but i reinstalled wacom drivers and that seemed to do the trick. I was wondering why it switched to Windows Ink. It would do so if Expresii can't find the wintab32.dll which is supposed to be installed by your Wacom driver. 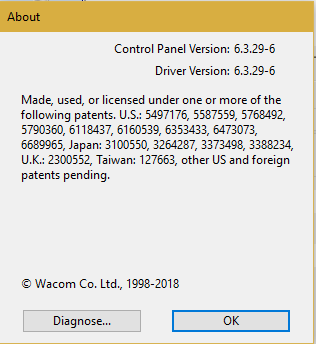 It might be that, for some reason, wintab32.dll in your system32 folder got removed, and now reinstalling Wacom driver replaces it, and so now Expresii can read WACOM's wintab32.dll correctly.